You are most likely reading this article because you crashed your computer. There is nothing you can do but stare at the blue screen filled with codes. 0x00000116 is one of the most common blue screen errors. It is also one of the most fatal errors in Windows. That is why this error is called Blue Screen of Death (BSOD). So far we have seen all edition of Windows (Windows 7, Windows 8, Windows 8.1, Windows 10) suffers from this error. This article examines possible causes and how to fix Blue Screen error 0x00000116 in Windows. There are many possible causes for the Blue Screen error 0x00000116. This error simply means that there has been a major change to your system files and system can’t successfully adopt it. As a result, Windows crashes and display the blue screen with error 0x00000116. So far, we have seen following causes among our own readers. There is no ‘right’ way to fix the Blue Screen error 0x00000116 in Windows. In most cases, finding the probable cause can easily fix this error. So you must think hard about any significant changes made to Windows recently. If you can’t recall any, follow the solutions below. Click Start/Windows button and type “Update“. Click on “Windows Updates” and check for new updates. Install Windows updates and Restart your computer. Right click on Windows Command Promt and open it as Administrator. It may take a while to complete the check. Then follow on screen instructions. If your hard drive is damaged, you must replace it. Type sfc/scannow and hit enter. Click Start/Windows button and type “System Restore“. Right click on System Restore and Backup and open it as Administrator. Choose Recommended Restore point or a date prior to the incident. Click Start/Windows button and type “Device Manager“. Right click on Device Manager and open it as Administrator. Right click on each hardware driver and click Update Driver. Delete all the files in the folder that will open. Go to File -> Export and select the Folder. Save as Windows Operating System Backup and press Enter. The file will be saved as a registry (.reg). 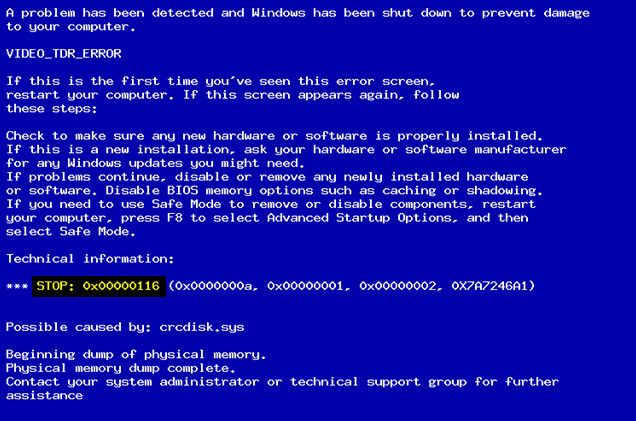 Viruses and malware are responsible for more than half the systems affected with Blue Screen error 0x00000116. It is always a good idea to keep your virus and malware scanner up-to-date. Run a full system scan and take actions to clean up any recent unwanted files. As I mentioned earlier, there is no right way to fix the Blue Screen error 0x00000116 in Windows. Solutions mentioned above have helped the majority of the people affected. If you have any other ways fix this error, share it with us using the comments field below. Great article. System restore worked for me. Not sure what caused the error tho. Glad it worked. Most of the time it is a driver related issue.